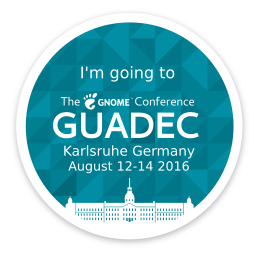 That’s right, tomorrow I will take the train down to Karlsruhe to attend GUADEC 2016 after a 3-year absence (time flies!). I am looking forward to meeting old friends and attending some nice talks and BOF events. At Endless we have been very busy working on our next release of the Endless OS and some of my colleagues are giving very interesting talks related to our work so be sure to check them out! I have been working on the applications story which will be using Flatpak and GNOME Software so if you are interested in knowing more about that we can have a chat too. Estou a pensar fazer o meu inter rail, e como não sei nada sobre isso decide pesquisar, encontrei a sua página a explicar toda a viagem, gostei muito, e pude retirar algumas coisas daqui bastantes importantes, obrigado! !